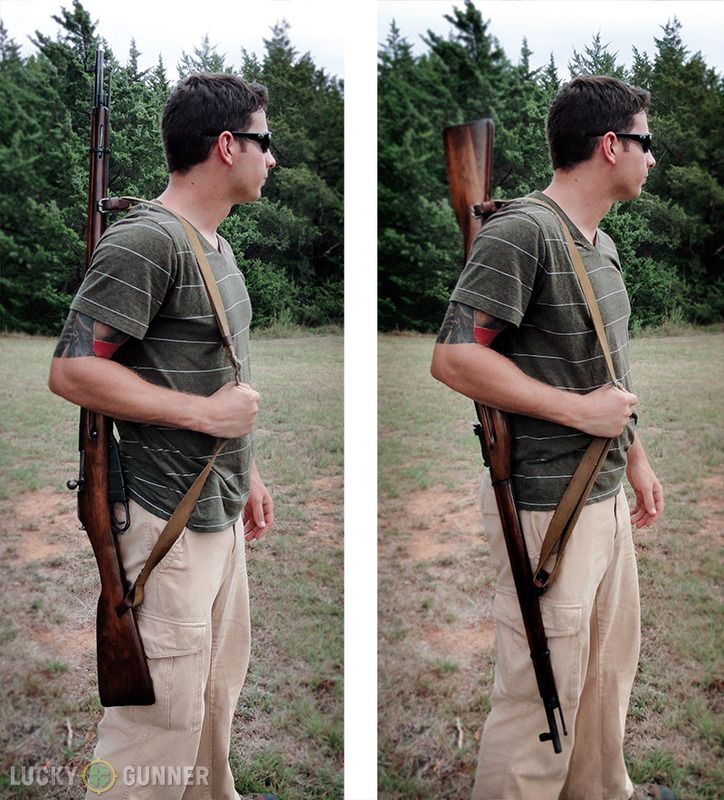 For as long as rifles have been around we’ve had slings to help carry them. Whether you’re out deer hunting in the forest or taking an advanced carbine class at a firearms training facility it’s very helpful to be able to retain control of your rifle without having to hold it in your hands all the time, and also to distribute the weight more evenly over your body. All rifle slings will allow you to accomplish this task but simply using slings to help carry your rifle doesn’t allow you to take full advantage of them. A good sling should also be able to serve as an effective shooting support. While this may not seem essential for those of us who mainly shoot from the bench or a bipod it is worth noting that this extra utility is essentially free since a shooting sling is not necessarily heavier, bulkier, or even more costly than a traditional carry strap. Today we’re looking at the most popular and useful types of rifle slings in order to build an understanding of which one is right for your particular needs. We’re also going to briefly cover some of the different techniques for using slings as shooting supports so you’ll know a how to use a rifle sling a multitude of different ways. This is by far the most common type of sling. 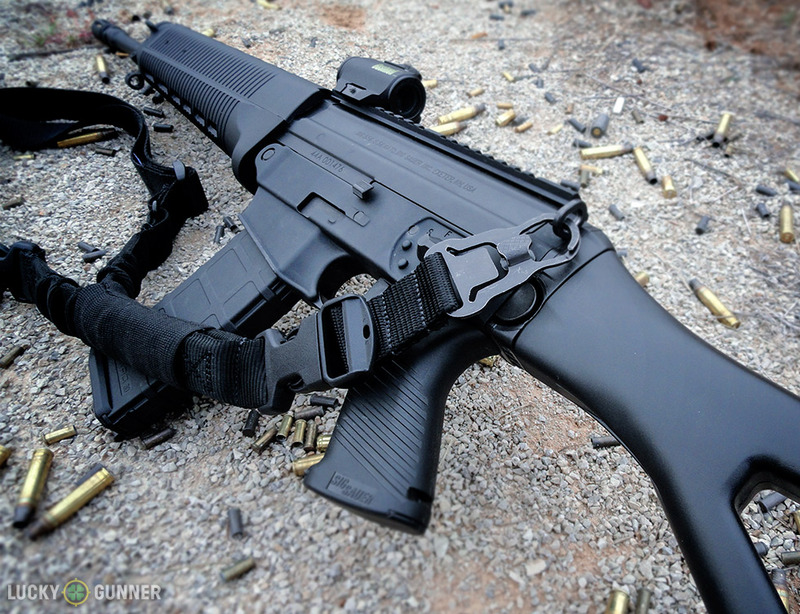 It consists of a simple strap that attaches to the front and rear of the rifle on the underside of the stock. The carry strap sling may also have a padded section to help ease the discomfort that comes with carrying a rifle over long periods of time. If all you need to do is occasionally toss your rifle or shotgun over one shoulder then this may be the best option for you. You’ve got some flexibility with how you carry your rifle with a carry strap as well, such as muzzle up or muzzle down, and whether you wish to carry on your strong side, support side, or across your back. Typically carry straps don’t adjust easily though, so it’s best to pick one style of carry and leave the sling adjusted for the appropriate length. Even though it is not necessarily intended to be used as a shooting aid, the carry strap may be wrapped around the support arm to provide a small amount of stability. 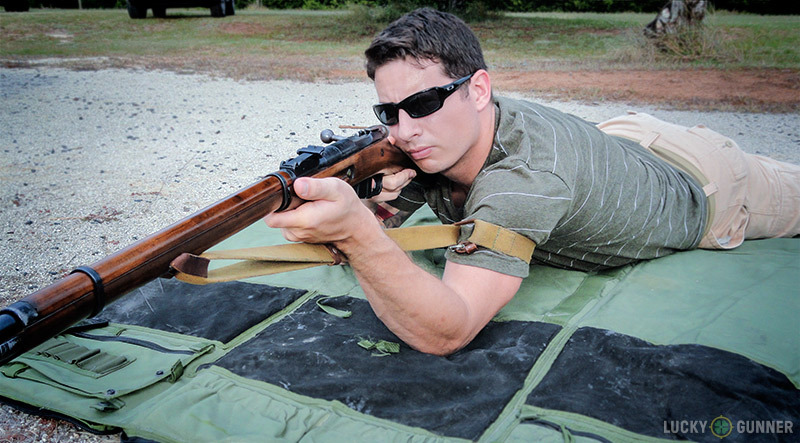 This technique is known as the “hasty sling.” Different shooters will likely experiences different levels of confidence in this technique, but in my experience the added stability is very slight due to the fact that most of the tension merely serves to pull the rifle sideways rather than deep into the shoulder. There are several slings that fit into this category such as the USGI web sling, the Whelen sling, and the Ching sling. For the purposes of this article we’ll broadly categorize these slings as either “detached loop slings” or “integrated loop slings.” All of these slings function just fine as carry straps but have the added advantage of allowing you to steady your aim significantly by anchoring the rifle more securely to your body by means of a loop around the supporting arm. I cannot emphasize enough how effective a proper shooting sling can be with a little training and practice. The USGI web sling is an excellent example of a detached loop sling. 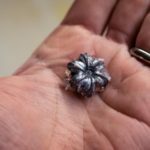 It is typically cotton or nylon and is designed to attach to the rigid sling mounts found on the M1 Garand, M14, and M16 series rifles. The USGI web sling adjusts easily and can be purchased as military surplus or as new production. To use a GI style sling as a shooting support it is necessary to detach the rear end from the rifle, thus the “detached-loop” designation. Doing this allows you to create a loop with the end of the sling that you can use to anchor the rifle to your supporting arm. This is the method taught to all United States Marine Corps recruits during rifle training as well as to civilians through programs like the CMP and Project Appleseed. Other surplus web slings such as the standard Mosin Nagant web sling and the Lee Enfield web sling can be used in a similar fashion. Integrated-loop slings such as the Whelen sling and M1907 sling offer the same type of support as the USGI web sling but with the added convenience of remaining attached to both the front and the rear of the rifle at all times. The shooting loop on these slings is created when the sling strap doubles back over itself at the front sling swivel and attaches back to itself towards the rear of the stock. These slings are typically of leather construction and are less common and more expensive than the USGI sling. Integrated-loop slings tend to be more difficult to adjust than the USGI style slings so if you plan on shooting from a variety of positions you may want to skip this one since proper sling length will change significantly between shooting positions. The Ching sling is a bit of a special case sling and was specifically designed to address the shortcomings of other rifle slings. Like integrated-loop slings it incorporates a built-in shooting loop which avoids the need to detach the rear of the sling from the rifle. It improves upon other sling designs even further by utilizing a third sling swivel in order to keep the shooting loop open and accessible for quick use in the field. For this reason the Ching sling is a favorite of large game hunters, though it does require the installation of a third sling swivel. Patrol slings deviate from the previously discussed slings in that they are designed primarily to retain the rifle on the shooter’s front side rather than on the back or over the shoulder. They offer excellent weapon retention while also allowing the shooter to quickly bring the rifle on target from a slung position. There are three primary types of patrol slings: the single-point, two-point, and three-point sling. The single-point sling excels at accommodating a wide variety of shooting positions and movements at the cost of shooting support and rifle retention. The single point sling wraps around the body but only attaches to the rifle at the rear of the receiver. It ensures that you don’t drop or otherwise lose your rifle while still giving you the freedom of movement to perform actions such as switching the rifle between your dominant and non-dominant side. It should be noted however that when the rifle is allowed to dangle it will flop around considerably more than with any other type of sling and it cannot be used as a traditional shooting brace the way that other slings can be. 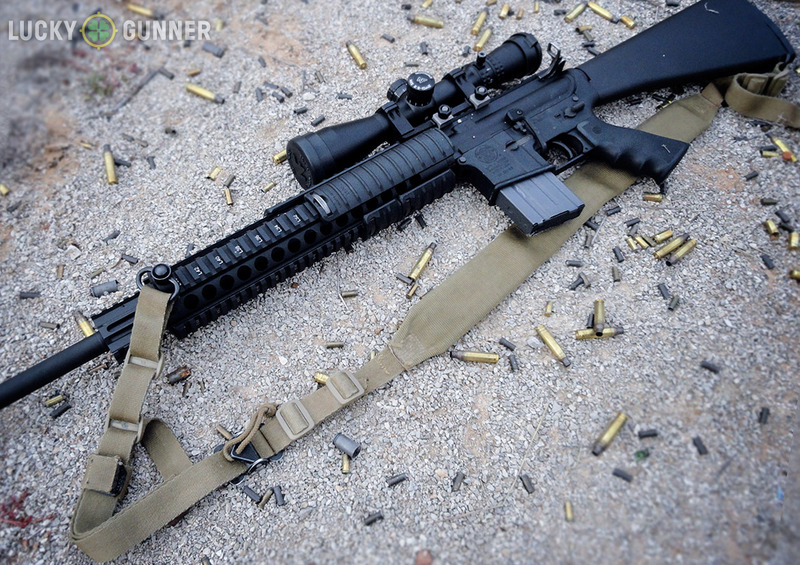 Single-point slings are great for fast-paced tactical carbine courses and general range use. Because the stock tension helps redistribute the weight of the rifle and keep the muzzle up I’m able to use a pistol stance with this full-size Sig 556. It’s obviously less silly with a pistol. One interesting feature of the single-point sling over any other type of sling is the ability to use it as a “soft stock” with the increasingly popular AK and AR-15 platform pistols. With a properly adjusted single-point sling you can create tension in the sling when using a normal handgun-firing stance. This tension distributes some of the weight of the gun to your body, reducing arm fatigue and also drawing the rear of the pistol to one specific point which helps to naturally correct the direction of the muzzle if it veers off target. The two-point sling looks very much like the carry strap but the main difference is that it is intended to be mounted on the side of the rifle and normally incorporates some type of quick adjustment mechanism. This allows the rifle to be carried across the front or the back of the body comfortably and securely, as well as to be used in the same manner as a carry strap. Because the sling can be wrapped around the body and quickly tightened, it provides a moderate amount of offhand shooting support, though not as much as is offered by dedicated shooting slings. The two-point sling is my overall favorite type of sling because it is so versatile, simple, and quick to use. Finally there is the three-point sling. 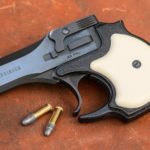 In short, the three-point sling is an abomination that combines the limitations of the single and two-point slings while managing to introduce entirely new shortcomings of its own. 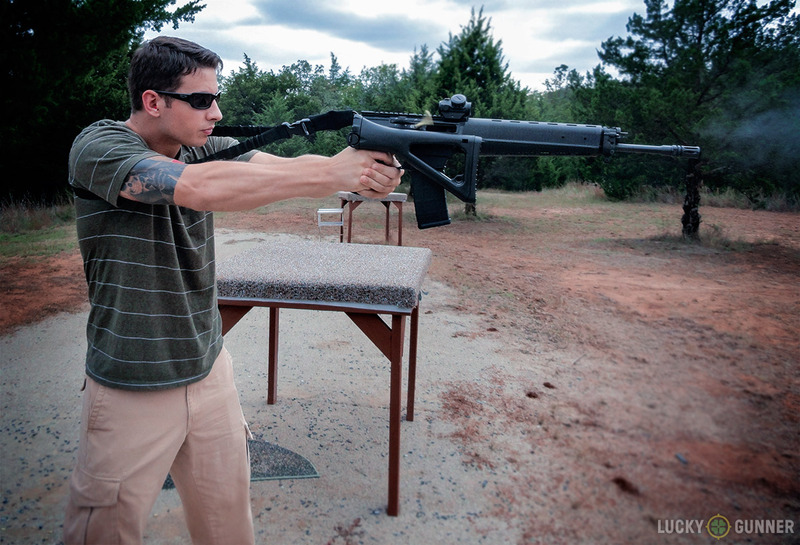 This style of sling attaches to both the front and rear of the rifle like a two-point sling but uses a second loop of fabric to wrap around the shooter. In addition to being complicated, bulky, and allowing the rifle to flop around all over the place, this setup causes a strap of material to lay alongside the rifle which can interfere with operation of the charging handle, bolt release, or even block the ejection port if used by a left-handed shooter. 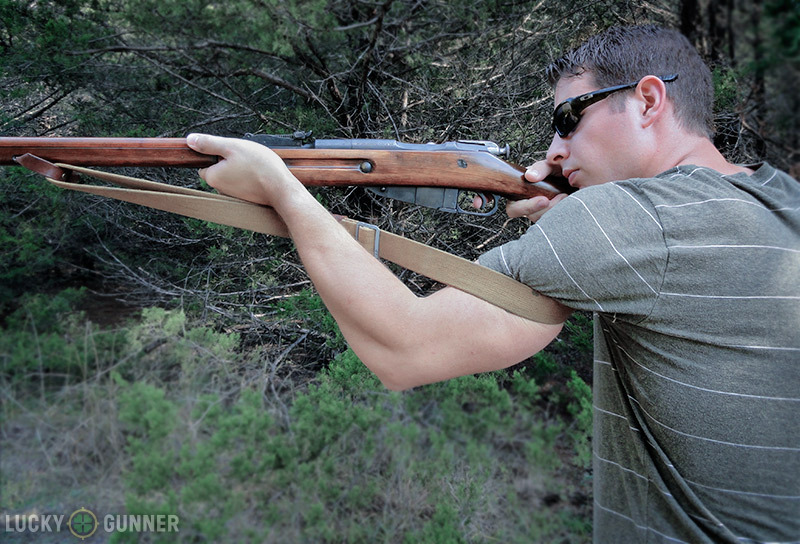 Typically a quality two-point sling will better serve those who do use three-point slings. Slings have tremendous advantages that every rifleman can use whether it’s in the field on a hunt or just a quick session at the range. We tend to lose sight of the power and utility of slings amid the dizzying array of optics and other rifle accessories available today, but rifle slings are as relevant and as important as they ever have been. If you’ve got a rifle, there’s probably a sling to make it better.